It was Friday night, and I had planned to meet a new acquaintance in Sherman Oaks for an early supper. That meant going east from Brentwood—either attempting the freeway or going through Coldwater Canyon. I was still hesitating, considering bailing even though it was already 5 p.m. and we were scheduled to meet at 6:30. It was unconscionably late to call with an excuse. A stomachache? A work deadline? I weighed my loyalty. Would we manage to sustain our fledgling friendship if I took a walk—or rather did not make the drive and offered up a little white lie? Not cool, I decided. This was a person I had met at a party and clicked with immediately. We were at the beginning of something. I might snuff it out if I didn’t man up, get in the car, put on a little music, and keep the date. I suppose the word date might seem overwrought or romantic. But I take my friendships seriously. I try to nurture the new ones and maintain the old ones, and that can be unusually difficult in this city. How easy it is to hop a cab or subway in Manhattan and meet a pal at a restaurant or show. You can even walk! There is the bonus of spontaneity. But in L.A. sustaining the connections requires tenacity and strategizing. As I buckled myself in, I thought of the curse of my hometown, its damnable hugeness, and of the friends I had lost along the way. Not in big blowouts or noisy partings. I have always been a firm believer that high-tension drama belongs to familial and love relationships and that friends should be a refuge from that. I am also convinced that competition is deadly, though destructive insecurities can quickly arise in a place where the emphasis on beauty and money is pretty fierce. I have let friendships ebb or slip away from lack of commitment and/or geographic laziness. You meet, there’s that zing of recognition, of shared humor, and you are sure you are in; you have found a buddy who will help assuage your loneliness in this city’s sprawl. You make plans. Your new playmate lives in Pasadena. Not a problem, you think, chuckling on first meeting at some small remark that only you and she are laughing at—a little circle of mirth. Wow. Great. A new friend. I can get to Pasadena. We can meet at the Norton Simon or saunter through Old Town. She can come to my Westside cottage—bring her dog if she has one, and we can walk our pets in the hills. We do our back-and-forth for a while. We race through our histories as we get to know each other, as women are wont to do. There is every intention of keeping this thing alive, like watering a plant. Then stuff happens. A parent gets sick, a workload gets heavier—and the effort to zig and zag across zip codes becomes too much. Face-to-face meetings, the lifeblood of a true friendship where you can see what’s in someone’s eyes—a giggle, a tear, a dare—grow rarer, and you begin to rely on e-mails and Facebook. Hi, how are you? I am still here. Finally those become infrequent, until you are down to a once-a-year holiday greeting. Obviously this happens everywhere. But maintaining a real human connection is harder in L.A., where we tend to establish situational friendships. We coalesce around an activity, joining forces in a project or passion of the moment, be it training for a marathon or exercising a young pup. I made a garrulous family out of dog park friends. I saw them every day for maybe two or three years. Most were just marrying and having kids. On hot summer afternoons or chilly winter mornings we kibitzed about our lives, dreams, animals. We took it out of the park. We had lunches and potluck dinners. We met one another’s mates. Then our dogs got older. They needed less exercise. The infants intervened. Bit by bit we grew apart. Occasionally a greeting pops up on the computer or a holiday card comes and I am wistful—for them and for a time when my now gray-chinned Lab was younger. The most intense of these bonding experiences can occur around work, in a newsroom or a high-tech start-up, when everyone is abuzz with creativity. Nowhere does this happen with as much fervor as in the entertainment business, in many ways the symbolic heart of our city. People come together on a set, and the chemistry can be sudden and powerful. The days are long. There is joy, loyalty, shorthand. My father was an actor turned director. I used to visit him when he was working, and he was never happier. There was the canvas chair with his name on it, everyone swirling around him saying, “Hi, Don. How’s this, Don?” I was jealous of the energy, the electricity, the camaraderie that seemed so deep and fun. Then the adventure was over, the movie in the can, and everyone returned to their suburban nests, waiting for the oft long-delayed chance to ply their trade again. For my dad there was always a pronounced letdown when the film wrapped. He would sit in the living room in his bathrobe playing endless hands of solitaire. He would be noticeably depressed, missing his recent tribe. He’d stay in touch with one or more of them, but that didn’t happen often. I do think men’s friendships are more activity defined. They bond over an enterprise or a sport, participating in one or watching it on TV—nacho bros. 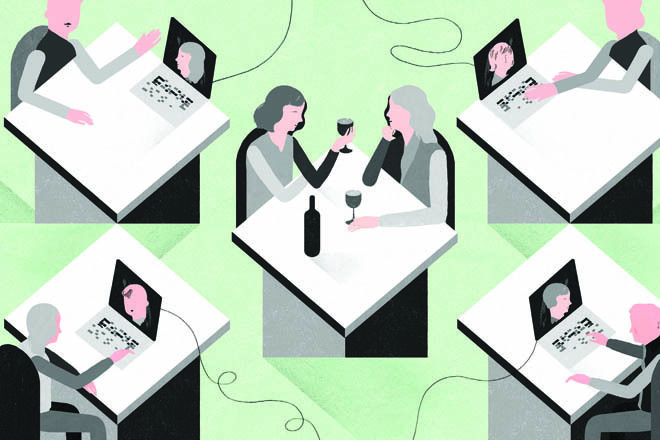 Whether by instinct or socialization or need, we women are more prone to hang out and trade intimate life details, just as we are more inclined to be attentive to our friendships. We worry about them—and feel guilty when we don’t pay attention or get too busy and let them slide. Of course for us, too, a hobby or an athletic pursuit can provide strong glue. I am the last woman I know to take up yoga. Twice a week I join a friend at her house for lessons (how lucky I am that she lives within walking distance). We have become even closer—and also devoted to our talented and lovely instructor. Between poses and oms we laugh a lot (hardly standard etiquette), and sometimes when the lesson is over we have supper. The other friends I see with the same regularity are walkers and hikers. We also catch a movie or a bite—but striding through the streets or on the trails is what keeps us together. My oldest friends—from high school and college—no longer live here. They relocated to Oakland and Aspen and Iowa City. But they often have reason to return, for work or family or to visit me. That is one of the good things about L.A.: I can offer up glorious restaurants and museums, not to mention strolls along the coast at dusk. I run a sort of B&B now. When these women come to town, I introduce them to my newer pals, those I have held onto, the ones who didn’t drift back into their own lives in this anonymous spill. I think of those “lost” women when I am flying into LAX and looking down. Hello out there. How are you? What’s going on? There have been times when a bygone acquaintance has reached out—inevitably through social media—and I sit for a while and look at the invitation, and I do not signal back. I remember harsh words and I say, Thank you, no. But others I truly miss. When I ponder what quality they have in common, it is simple: They have a lightness of being, their own sunshine, a ray in which I would like to sit again. One friend in particular comes to mind. A writer and mom of three small kids, she can go from empathetic tears to full-tilt hilarity in a second. I love her range, her heart. I have the easier schedule. It is on me to make a date. I was glad I made that Friday-night trek to the Valley. We had a raucous evening and agreed we were in for the duration. Just one of those chemistry things: similar values, histories, dispositional set points. We do what it takes. We make maddening drives and late-night phone calls—and yes, exchange e-mails, but only as a weak substitute. We talk about this city and the unique challenges it presents, and in our Pollyanna moments we agree that L.A. might be perversely positive when it comes to friendships because you have to work hard at them or they might simply vanish into the air.